Back in winners circle: The Harlequins are at home this Saturday, which is Ladies Day at Campbelltown Showground. The Harlequins travelled to Vincentia on Saturday to take on and defeat home team Shoalhaven in first and second grade. In third grade, the Quins, despite a gallant effort, were defeated by Vincentia. First grade returned to the winners circle this week with a five try effort of their own. The Harlequin forwards dominated again to steer the team to 34-7 win. Man of the match Havea Halatoa scored two strong tries whilst captain Adam Choice bagged a double of tries, kicked three conversions and one penalty goal. Victory over Shoalhaven. The win takes the Quinnies to third on the competition ladder. In a man of the match performance five eighth Luke Turia took control to help steer seconds around the park. The five tries were shared across five players: Liam Kaldasuan, Elijah Sa, Anthony Soloi, Noa Raura and Haze Aupouri. Prop Ricky Flaxman kicked four conversions in the 33-22 win. ♦ Third grade went up against competition leaders Vincentia on their home ground at the Bay Basin Leisure Centre. The home team proved too strong for a gallant Harlequin third grade, winning 42-14. The Harlequins struggled in the first half but finished strongly with two converted tries, one to half back Shayde Aupouri and one to Mark Lauano. Harlequins man of the match was Mark Lauano. 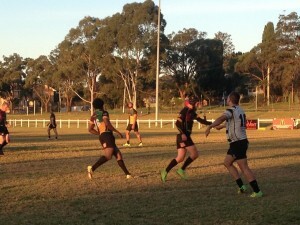 ♦ The Harlequin women’s team found themselves up against a very experienced Warringah side boasting a number of Wallaroo and National Sevens players. Warringah hit the ground running and had run in three converted tries in five minutes before Campbelltown knew what hit them. Campbelltown rallied and continued to mount pressure on the Warringah team and were rewarded with a try under the posts which was converted. Campbelltown started to dominate in the scrums but constantly turned ball over when in good attacking positions which saw the fast Warringah backs capitalise to score a number of runaway tries. The constant possession saw the Warringah side run in another number of tries to complete a 62-7 win. Best for Campbelltown were Sharyn Laws, who did not stop all game and pulled off a number of great tackles. Sarah Cook and Brenda Auelela also had strong games. ♦ This Saturday is Ladies Day at the Campbelltown Showgrounds when the Harlequins take on Woolongong University. All the ladies are welcome and will receive a free Harlequin cocktail (from 2pm) on arrival with a number of giveaways and prizes throughout the day. Matches start at 11am, with the ladies at 12.15 and first grade at 3pm.